If your problem involving volumes of Excel® spreadsheets files and requirements for flexibility in consolidation then Spreadsheet Consolidator for Excel is the accurate tool for you. 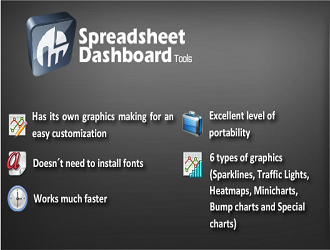 Dashboard Tools for Excel is an add-in software for Microsoft® Excel® which helps you to understand complex relationships in your Excel models. Excel Data Management Essential tools for data analysis and tables management for novice and advanced Excel's users.